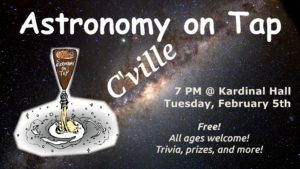 Come learn about the Universe with Astronomy on Tap! Astronomy on Tap events are hosted around the world. You will interact with professional and amateur astronomers as they share their knowledge of the cosmos in an informal venue. Each event consists of two or three short talks on an astronomy-related topic. Between talks, you can test your knowledge with trivia and games to win astronomy-themed prizes! We hope you will join us at this free and family-friendly event! The second Astronomy on Tap event in Charlottesville will begin at 7:00 PM on Tuesday, February 5th at Kardinal Hall. Arrive early to get a good seat (and put in your food/drink order)! The event will end around 9 PM, but you are welcome to come and go at your leisure.